Bark, Skin and Cedar is an intelligent and grand exploration of that great Canadian icon-the canoe. From the graceful birch bark vessels of the Micmac Indians to the wide and sturdy Haida dugouts, from the canvas-covered Chestnut Prospector to the sleek dragon racing boats, the fragile but powerful craft defines our history and our culture in a myriad of ways. James Raffan takes us on a canoe tripping journey: we are transported back in time to the notion of the canoe as a luminal vehicle, bearing the human spirit from one world to another; we are there at the Lachine Rapids, where Jacques Cartier and Samuel de Champlain learned to paddle canoes, so different from their sea-faring vessels; we explore the canoe trip as a reflection of a heroic quest and the craft as a cradle or womb out of which love and new life will grow; and we investigate the canoe as a rich muse for our artists and profitable inspiration for our advertisers. Along the way we meet some of the canoe’s most ardent and colorful paddlers: Governor George Simpson, Frances Ann Hopkins, Edwin Tappan Adney, Eric Morse, Pierre Trudeau, Bill Mason and Kirk Wipper. 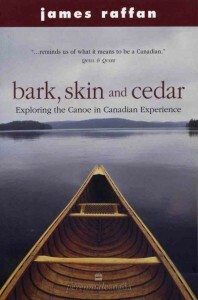 With its fresh and unique blend of canoe history, legend, insight and imagination presented in an attractive gift book format, Bark, Skin and Cedar will capture a large and enthusiastic reading audience. Excellent book giving plenty informations in a chronologic way, easy to understand and its profund literature constitute a perfect canadian heritage introduction.